The waves of purported voter fraud that swept the U.S. during this past voting season have spurred the proposition of Senate Bill 3 in the New Hampshire Legislature by state Republicans — a measure that some have claimed threatens student voting in future elections by changing definitions of residency within the state. According to District 19 NH Sen. Regina Birdsell, the main sponsor of the bill, SB 3 is a trust-but-verify law that seeks to tighten the definition of domicile, or a person’s place of residence, to maintain integrity in the state’s voting systems. Voting in New Hampshire was thrust into the national spotlight last November when President Donald Trump’s campaign claimed that busloads of people came from Massachusetts to vote in the 2016 presidential election. While both Republicans and Democrats in New Hampshire agree that such claims are not grounded in truth, Birdsell and other Republican state leaders have said that the perception of voter fraud has caused concern among their constituents. If SB 3 is passed, Birdsell says voters will experience no difference in voting procedures in comparison to the past — people will still be allowed to vote with same-day registration, a measure that 13 states and the District of Columbia have instituted as of November 2016. Votes will not default to provisional ones if people fail to present proof of domicile in New Hampshire, as the state requires the results of a vote to be released that same day. However, if voters do not have sufficient proof of domicile for same-day registration — such as a signed lease or utility bills — they will be asked to mail proof within 10 days of voting and will no longer have the option of utilizing domicile affidavits to verify their residency. If people do not send in the required information within this period of time, the supervisor of the checklist will be tasked with verifying the residency of the voter by going through public municipal records, having someone go directly to the address listed on the voter registration or by working with the NH Secretary of State to send a verification letter. Charges will only be brought if people “wrongfully or purposefully” claim domicile in New Hampshire in order to vote, Birdsell said. District 12 NH Rep. Sharon Nordgren and other Democrats, however, disagree about the effects that the bill will have on voting, especially for students. Nordgren believes the bill is an effort to dissuade college students from voting because most students, especially at the College and the University of New Hampshire, tend to vote Democratic. She said that SB 3, as it stands today, is “confusing” and difficult to understand, and that students who do not present sufficient evidence of domicile will have to fill out a form that has been described as “complicated.” Nordgren said although this is not the state’s first attempt to impose voting restrictions, this is the first time in over a decade that New Hampshire has a Republican governor in Chris Sununu, whose governorship has given Republicans a chance to implement such a bill. She said the voter turnout for the past presidential election was so large that she feels Republicans want to do something “drastic” to prevent the left from swinging the next vote. In the 2016 presidential election, the race between Trump and former Democratic presidential candidate Hillary Clinton was tight — Clinton won the state’s four electoral votes by 2,736 votes, according to the New York Times. She said she personally helped students register to vote many times, and that she has never seen abnormalities that would suggest that non-domiciled people are attempting to vote in local elections. She said that to create and support a bill based on “an untruth in terms of the level of illegal voter registration activity” is shameful and makes the process of voting even more complicated than it already is. “The process that the state’s current legislations have created is so cumbersome and lengthy for election volunteers and voters to participate in that I think in and of itself [the bill] will have a chilling effect on voter registration participation in our elections in New Hampshire,” Griffin said. District 9 NH Sen. Andy Sanborn, who is also a sponsor of SB 3, disagreed that New Hampshire’s voting law is already restrictive, calling it one of the most “lax” in the country with “pragmatically no restriction.” Furthermore, he said that in the past, over 500 recounts of votes show very close races and that “literally dozens of votes have been decided by under five votes.” Thus, when there are people who do vote in New Hampshire elections who are not domiciled in New Hampshire, it dilutes the votes of those who have a “vested interest” in the state regarding schools, taxes, regulations and representation, he said. 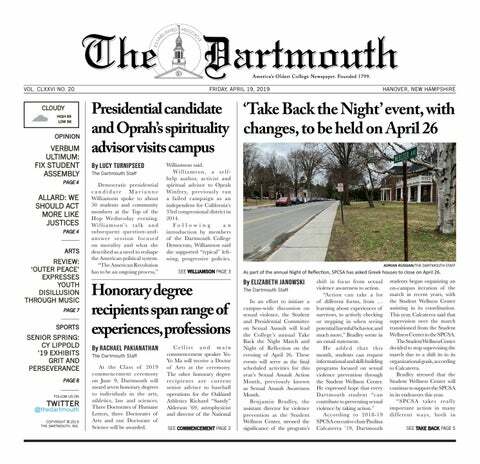 Vice president of the Dartmouth College Republicans Abraham Herrera ’18 agreed that he would not want students, regardless of their party affiliation, to vote in the state elections if they do not have a vested interest in the state. He said that SB 3 is “common sense reform” to make sure that the residents who do vote are actually residents, and that people who want to participate in the democratic political process should establish residency in New Hampshire if they want to vote here. “I wouldn’t particularly feel comfortable having a student population that generally tends to vote liberal and only lives in a place for four years to affect local elections or even national elections,” he said. He added that if it was the other way around, and it was a generally conservative student body, he would feel the same way. While this may be the case from the students’ perspective, Hanover director of administrative services Betsy McClain said practically speaking, students at the College are very “lucky” that the Office of Residential Life and the town of Hanover have a close relationship that allows ORL to confirm students’ residencies immediately, even if students do not have the necessary documents. She noted this will not change even if SB 3 is enacted. However, she said students who live off campus and are not under the jurisdiction of ORL will not be able to rely on the College for domicile verification. McClain, however, pointed to the larger implications that the bill has on voting volunteers and increased responsibilities of the supervisor of the checklist. She says that New Hampshire state law has gotten “increasingly onerous” with the voter identification regulations, such as requiring that volunteers take pictures of people who do not show voter ID, and that this bill will be an “additional burden” imposed on local election officials, most of whom are volunteers. She said the list of requirements that need to be checked to ensure voter integrity will complicate and confuse the process, which could discourage election volunteering. “My big concern … is that this is really going to impact us with being able to encourage a new generation of volunteers to work, come in and help us run these elections,” she said. The New Hampshire legislature consists of 24 members of the Senate and 400 Representatives in the House of Representatives. Bills can only be drafted by members of these bodies and follow slightly varying procedures depending on the body to which the sponsor of the bill belongs. However, both bodies have standing committees that hear the proposed bills initially, and all bills must go through public hearings as well. Members of the bodies may begin acting on the bill as quickly as the day after reports from the committee hearings appear in the House calendar. There is a second reading of the bill on the floor of the House or Senate, during which members engage in debate and make amendments. Once the bill has passed within its original body of legislature, it goes through the other body with similar procedures. SB 3 was passed in the Senate with amendments and was heard in the House on April 18 by the Election Law Committee but has not yet been able to be voted on as of press time, Nordgren said. Before the bill is sent to Sununu through the New Hampshire Secretary of State for approval, it must be passed in exactly the same form in both the House and the Senate.